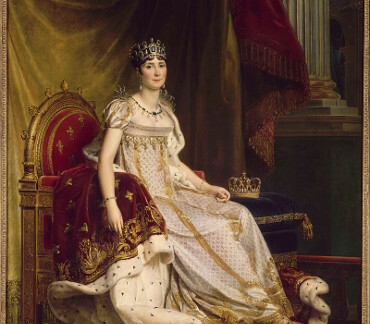 "Her marriage to Napoleon I was her second; her first husband Alexandre de Beauharnais was guillotined during the Reign of Terror, and she herself was imprisoned in the Carmes prison until five days after Alexandre's execution. Her two children by Alexandre became significant to royal lineage. Through her daughter, Hortense, she was the maternal grandmother of Napoléon III. Through her son, Eugène, she was the great-grandmother of later Swedish and Danish kings and queens. The reigning houses of Belgium, Norway and Luxembourg also descend from her. She did not bear Napoleon any children; as a result, he divorced her in 1810 to marry Marie Louise of Austria." Kaiserin der Franzosen und Ehefrau Napoléons (1763-1814). Autograph letter signed. St. Cloud. 2¼ SS. auf Doppelblatt. Mit geprägter Bordüre und Goldschnitt. 8vo. 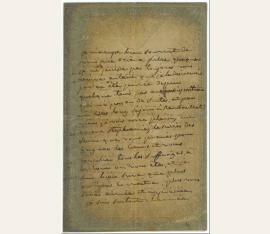 Insistent letter to her niece Stephanie Beauharnais who married the heir of throne Karl of Baden on October, 8th. It seems like for this reason Joséphine feels constrained to remind the young lady of her duties. Joséphine praises her niece's progress in winning "hearts" at the court, especially of Madame margravine. 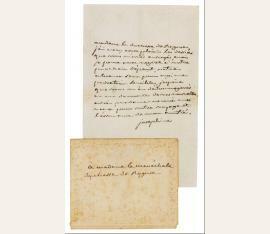 Furthermore Joséphine requests her to make the prince happy, to take care of her health, not to make a detour in life and give birth to a boy in eight month. 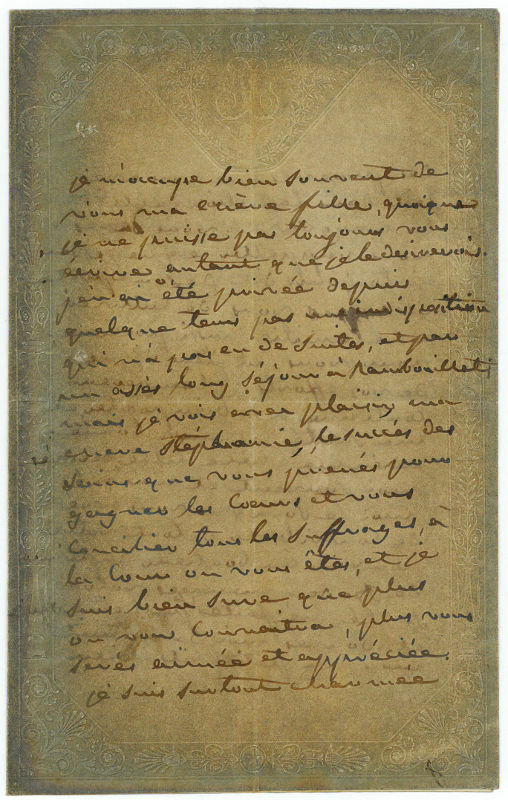 - The same year in March, Stephanie Beauharnais got adopted by Napoleon: "je m'occupe bien souvent de vous ma chère fille, [...] je vois avec plaisir ma chere Stéphanie, le succès des soins que vous prenés pour gagner les Coeurs et vous concilier tous les suffrages, à la Cour ou vous êtes [...] je suis surtout charmée des progrès que vous avés faits dans l'affection de M[a]d[am]e la margrave. [...] contribuer de tout votre pouvoir au bonheur du prince de Bade, ménagés votre santé, ne faites pas détour de vie et donnés moi dans huit mois un petit fils bien portant [...]". - Tiny hole (without text loss) in fol. 2, two small cuts in former stapling. Wrapping pages slightly discoloured (oxidized? )..